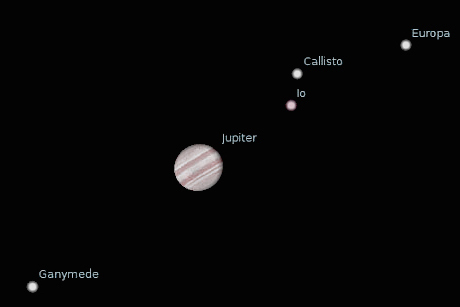 Jupiter with Io and three other moons. Io is now believed to be the source of the radio signals Nikola Tesla first detected in 1899. While conducting experiments in Colorado Springs during the summer of 1899, Nikola Tesla invented an unusual and highly-sensitive receiver as a tool to investigate the electrical properties of the earth. The receiver was set up to beep each time it detected subtle changes in voltage in the atmosphere, and soon Tesla was receiving atmospheric static from lightning discharges as far away as 1,500 km. One night, while working alone in his lab, the instrument began to play a succession of beeps. Tesla first considered whether the signals were electrical disturbances caused by the sun, aurora borealis, or earth currents. After further thought he concluded they weren’t caused by atmospheric disturbances, but must be extraterrestrial in origin. He assumed the signals he was receiving with his instrument were from Mars. He wrote in his journal: I felt as though I were present at the birth of a new knowledge or the revelation of a great truth. Tesla’s interviews with the press resulted in sensational headlines, and since then his discovery of radio signals from beyond the earth has been the subject of great controversy. Thirty years later Karl Jansky, an American physicist and radio engineer, had also been monitoring the radio signals from atmospheric storms. Using a special antenna he built, Jansky identified three distinct forms of static – from local thunderstorms, from distant thunderstorms, and from an unknown source of static he described as having the qualities of a ‘steady hiss’. He later identified this unknown source as emanating from the milky way galaxy. Karl Jansky was recognized as one of the founders of radio astronomy. About one hundred years after Tesla’s controversial discovery, two brothers – Kenneth and James Corum – one a physicist and the other an electrical engineer, launched an experimental and theoretical study to test a new theory. They knew Tesla’s original receiver was tuned to receive VLF (very low frequency) waves in the 8 to 22 KHz. range and set out to find the source of VLF signals originating from space during the summer of 1899. They discovered that Io, one of Jupiter’s moons, emits a 10 KHz signal as it passes through a torus of charged plasma particles surrounding the planet. It is known among scientists that the ionosphere is opaque at these frequencies; but under certain conditions – such as sun spots – the earth’s magnetic field will create something known as an ‘ionospheric window’ in the lower VLF range. The Corums confirmed that this window could have been open during the time frame of Tesla’s experiments. NASA now states that both Jupiter and Saturn radiate intermittent signals toward the earth in the kilometric frequency range of Tesla’s receivers. Kenneth and James Corum have provided solid scientific evidence not only that Nikola Tesla was observing real phenomena – that the signals he was picking up with his receiver were planetary in origin – but that Tesla had made the first successful observations in radio astronomy, more than 30 years before Karl Jansky.